... Sorry about that! Now, where were we? Ah yes, Ferrari has dropped a surprise new supercar on us, the J50. Well, we say "surprise" in the sense that the press and public didn't know about it, however it's not really a surprise considering that the limited run of 10 vehicles made have already been sold. Regardless of the fact that even if you are rich as the ancient King of Lydia Croesus you still can't have one doesn't negate that the J50 sure is an impressive looking and insanely powerful car that is worth slobbering over. 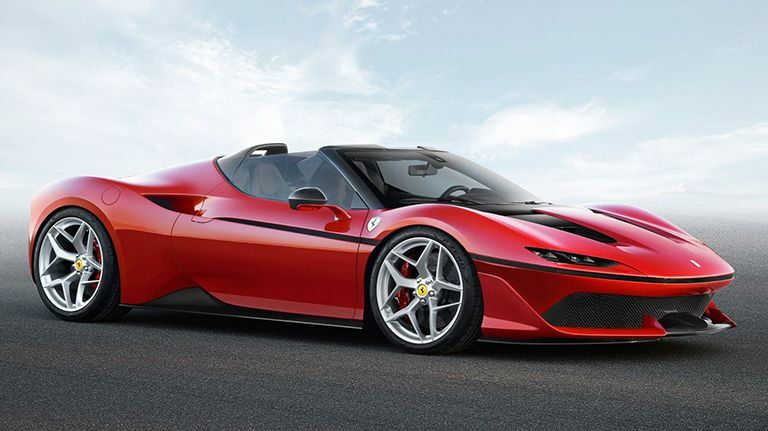 The J50 - named thus to celebrate Ferrari selling cars in Japan for 50 years - is based on the Ferrari 488 Spider, with its 3.9-litre turbo V8 tuned up by 20bhp to 681bhp. While no official 0-62mph time and top speed stats have been released, the Spider could hit 60mph in just 3 seconds and boasted a tasty top speed of 202mph, so we're guessing the J50 will make incremental improvements on these figures. Ferrari are also claiming the J50 boasts improved aerodynamic efficiency over the 488 Spider thanks to a reworked front bumper and twin carbon fibre air channels.